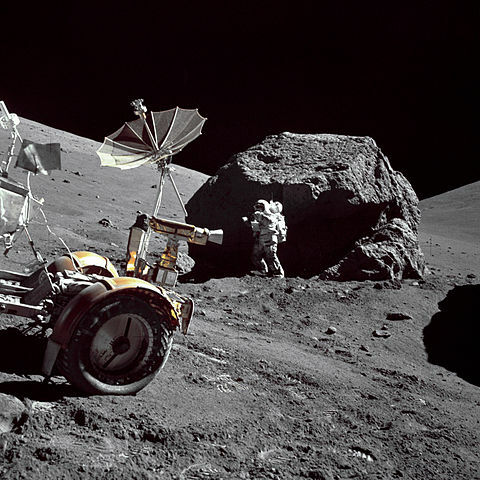 The team at PTScientists is marking the 45th anniversary of Apollo 17 this month. Apollo 17 is a mission that has special significance to us, not only because it was the final time humans walked on the surface of the Moon, but because we want to return to Apollo 17 with Mission to the Moon. 1) Apollo 17 was the first of NASA’s human missions to be launched at night – and the photos are spectacular as a result! 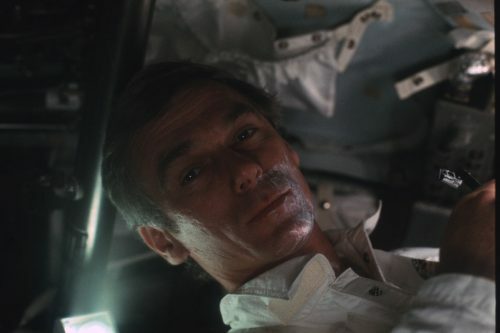 3) Gene Cernan was the only member of the Apollo 17 crew to have any previous spaceflight experience. 4) John Young, Charlie Duke and Stuart Roosa were the back-up crew for Apollo 17. This is the first time that members of the prime crew of one mission went on to be back-up on the mission directly after theirs! 5) Just because you’re in space doesn’t mean there’s an excuse for stubble! Gene Cernan and Ron Evans were both photographed shaving on their way to the Moon! 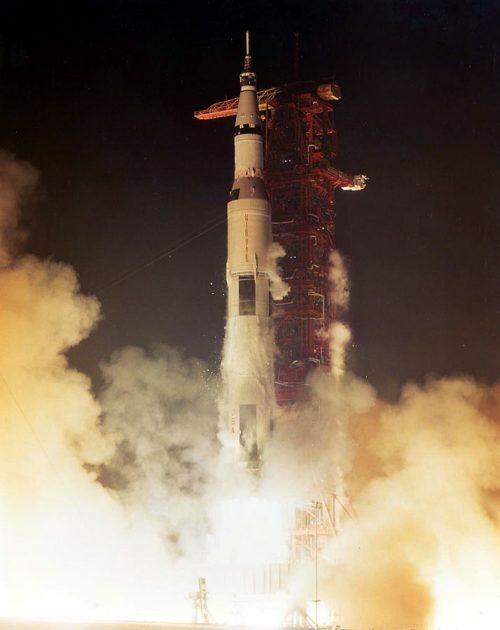 7) Most people think of the Space Shuttle programme when they hear the name “Challenger”, however, Apollo 17’s lunar module was the first to carry the name. Apollo 17’s command/service module was called America. 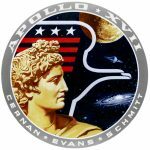 8) The three stars on the Apollo 17 mission patch represent the three astronauts, Gene Cernan, Harrison Schmitt and Ronald Evans. 9) Harrison Schmitt was the first geologist on the lunar surface – in fact he was the first scientist-astronaut, and was due to fly on Apollo 18. When that mission was cancelled due to budget cuts, Schmitt was moved to Apollo 17 and replaced test-pilot Joe Engle. 10) It’s not just something that happens on Earth – losing scissors is possible in space too! Ronald Evans lost his scissors, on the way to the Moon, and this was more than just an inconvenience because the surgical scissors were vital for opening food packets! 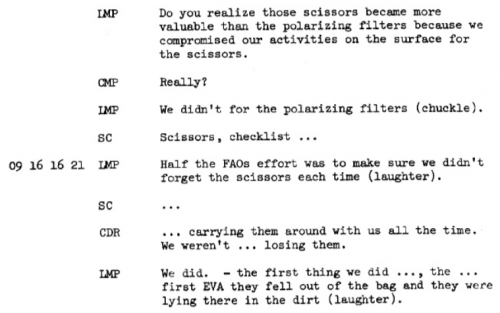 Since Evans was going to be alone while Cernan and Schmitt were on the surface of the Moon, they had to leave him with one of their pairs of scissors before they descended to the lunar surface. 11) Apollo 17 landed just 200 m away from its preferred landing point on the Moon– following a nominal descent. 12) The landing site of Taurus-Littrow was selected as rocks that were older and younger than those collected by previous Apollo missions were thought to be located there. 13) Gene Cernan and Harrison Schmitt landed on the lunar surface at 19:54 UTC on 11th December, 1972. The crew spent 74 hr 59 min 40 sec on the lunar surface – breaking the record for the longest stay on the Moon. 14) A year after their mission, Gene Cernan and Harrison Schmitt presented a US flag that they flew to the Moon to the team at mission control, Flight Director Eugene Kranz accepted it on their behalf. 15) Lunar Module Pilot Ronald Evans spent more time in lunar orbit than any other human, according to NASA.